NEWARK, Del., Sept. 18, 2018 /PRNewswire/ -- To mark the occasion of the upcoming Special Olympics World Games Abu Dhabi 2019, United Arab Emirates (UAE) Ambassador to the United States Yousef Al Otaiba today visited Special Olympics athletes and their coaches at Special Olympics USA's Training Camp at the University of Delaware. Over 300 athletes, coaches and support staff are expected to represent the US during Special Olympics World Games, which will be held in Abu Dhabi, UAE, this coming March 14-21, 2019. It will be the first ever Special Olympics World Games held in the Middle East region. Ambassador Yousef Al Otaiba joined members of Special Olympics USA’s basketball and table tennis teams who will be attending the World Games in Abu Dhabi in drills and other activities. 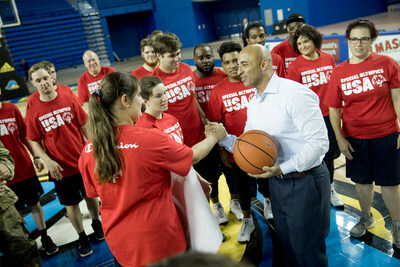 During the visit, Ambassador Al Otaiba joined members of Special Olympics USA's basketball and table tennis teams in drills and other activities. He also wished the athletes "good luck" at the upcoming World Games. In discussions with Special Olympics officials, Ambassador Al Otaiba emphasized the UAE's commitment to supporting people with intellectual disabilities, and commended Special Olympics for its work to encourage inclusion and acceptance. "The UAE is honored to host the Special Olympics World Games next year," said Ambassador Al Otaiba. "In line with the UAE government's efforts to promote greater understanding, inclusion and respect for people of determination, there is no better time than now for the World Games to take place in Abu Dhabi. And there is no better partner than Special Olympics, a remarkable worldwide movement that expands opportunities and transforms lives through sports." Athletes from around the US traveled to Delaware this week to meet their teammates and train at University of Delaware facilities. The weeklong training camp is the only time the entire delegation will be together prior to send-off in March. Participants will continue their training with tactics and skills learned during the week, working remotely with their Special Olympics USA coaches and locally with state Special Olympics staff. 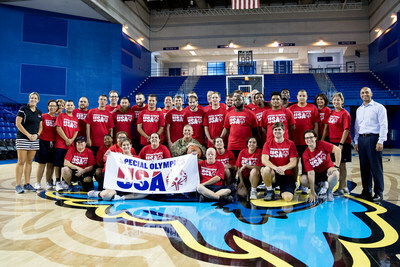 "Special Olympics USA is grateful for the support of Ambassador Al Otaiba and the UAE Embassy, not only during Training Camp, but in lead-up to World Games," said Head of Delegation Chris Hahn. "The Games serve as a valuable opportunity to not only spread our mission, but also as an opportunity to educate participants and fans about an area of the world they may never have otherwise experienced." Seven thousand athletes from more than 170 countries will compete across 24 sports at the Special Olympics World Games Abu Dhabi, and 500,000 spectators are expected to attend the Games. It will be the largest humanitarian and sporting event of 2019.